A funny thing happened on the way to this review. 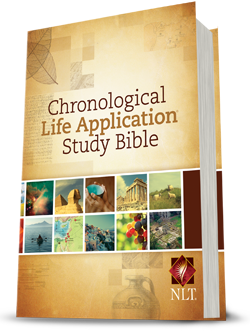 I received an offer to review the Chronological Life Application Study Bible, NLT version. I jumped on it immediately. Because I have always wanted a Life Application Study Bible, because I really loved it the year I read through the Bible chronologically, because it just looks so incredibly cool. It showed up. And my 16-year-old took one look at it and said, "Mom, we own one of those already." Ummm. Yeah. We do. As part of Tyndale Rewards (if you sign up through that link, you get 25 points, and I get 10!) I had saved up reward points a year or more ago so that I could get myself a Chronological Life Application Study Bible in the NLT version. Because I have always wanted a Life Application Study Bible, because I really loved it the year I read through the Bible chronologically, because I didn't own an NLT version, because it just looks so incredibly cool. So now we both have one. How amazing is that? And I was right. I love it. And I would have felt sorry for myself if I had looked it over too much before gifting it to my son. This Bible is SO COOL. So why do I love this Bible? Let me give you a few ideas. Chronological format. I don't think a chronological Bible should be the only Bible on your nightstand, but I do think everyone should go through the Bible chronologically at some point. It is amazing to read something like one of David's Psalms at the same time you are reading about him hiding out from Saul. Context. Yeah, you can do that with a regular Bible too, but with the Chronological one, it is right there for you. No planning involved. It is also wonderful to get books like Chronicles and Kings to line up, instead of reading a lot of the same stories from different points of view months apart. NLT Translation. I don't follow all of the arguments about which Bible translations are better and why. I'm aware of some of the disagreement, but not all of it. So if you have reason to hate the NLT, this Bible is also available in KJV. I'm not smart enough to make sense of the KJV though. I typically choose ESV when I have a choice, but I am finding that I really like the NLT too. I can understand it. I think understanding the text is a very good thing in a Chronological Bible, personally. I can always pull out a regular KJV to use for Bible Memory if I want it to sound prettier. Extensive notes. That'd be the Life Application parts, or the archaeological evidences part, or the timelines (wow, are there ever a lot of timelines! ), or the charts, or just the notes about the original Hebrew word. Lots of notes. I love the notes, and I'm finding they add so much to my reading. Photos and illustrations. There is lots of color in here. Not on every page by any stretch, but every few pages anyway. Some are of archaeological sites, some are of things like the trumpets mentioned in a passage. Some illustrate a key Bible verse. Maps. Gracious, are there ever maps. Nice ones, in color, with specific and relevant information. In the gospels, there are maps every couple of pages, so you really can see where things are taking place. Disclaimer: I received this book for free from Tyndale House Publishers. No other compensation was received. The fact that I received a complimentary product does not guarantee a favorable review. I like it took I was blessed yo have it come up through PaperBackSwap. At first I thought it was a hoax I was so excited. It arrived and was leather and in a Bible dipper cover. I couldn't believe it! Talk about a blessing!